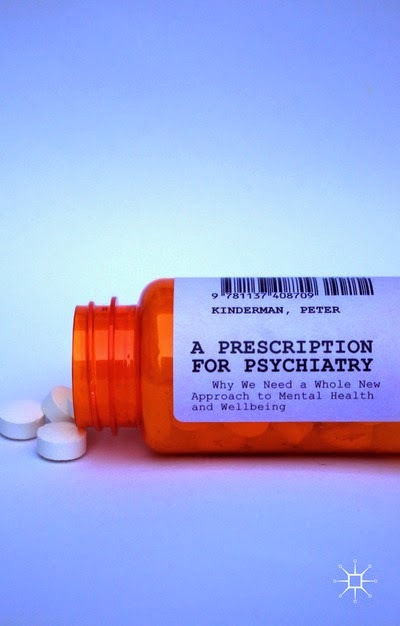 This month I have a review of Peter Kinderman's "A Prescription for Psychiatry" in the BJP. This post is a more extended version of the text published there. If the results are the same?" Battle-fatigued psychiatrists could be forgiven for wanting to steer clear of what looks like another attack on their profession. More waggish readers may wonder about responding with their own “formulation for clinical psychology”, and then there is the combative note. Does not the title seem to indicate a barely concealed desire to give psychiatrists a taste of their "own medicine"? However, such aversion would be a tremendous shame, for while there is some familiar ground trodden here, there is also much that is new, positive, and well worth some serious thought. There is also an idea that is more audacious and direct than usually be found in books about psychiatry. The book is made up of nine chapters, the first three of which occupy just over half the space. In this first half, more than in the second, there is a focus on criticism. The “disease model”, the use of diagnosis, and the role of medication are all subjected to scrutiny. Some of this ground is wearyingly familiar. On the subject of illness as opposed to “psychosocial problem”, we must ask whether Kinderman is giving full due to all the available evidence. The roles of trauma and of life events in schizophrenia are offered to raise our credence that this problem is best considered a psychological reaction. A major alternative theory, that some manifestations of this behavioural presentation may best be considered a developmental disorder, (after all, not everyone who meets the DSM criteria will have been abused or suffered other traumas) is not even mentioned, let alone appraised. On diagnosis: It is quite right that psychiatry should face the shameful aspects of its history. The tremendous psychic damage wrought by pathologising homosexuality for decades, and the odious debacle of draetopmania are not to be lightly dismissed. However, given the intentions of the present book, Kinderman might have done more to explain why these despicable examples have a substantive bearing on the question of modern diagnostic practice in general. The DSM is a problematic and contested document, but while we should feel queasy about its politics and many of its categories (“Oppositional Defiant Disorder” gets a justified grilling), even the most sceptical clinician cannot shy away from asking whether we can as easily dissolve those two major categories “Schizophrenia” and “Bipolar Disorder”. Kinderman favours a dimensional approach to mental distress, and a recent international survey of psychiatric attitudes (Reed et al, 2011) suggest that close to half of psychiatrists could feel the same way. A more significant question is whether this is really inconsistent with a system of classification; unless mental health problems could somehow be incorporated on the same single dimension (as opposed to a psychotic spectrum, an affective spectrum etc. ), there is no reason it should be. The book is, in my relatively ill-informed view, sensibly skeptical on medication, suggesting (via Joanna Moncrieff) the adoption of a “drug centred” model, with prescription based on anticipated effects of a compound rather than the anticipated imbalances caused by a disease. Such caution seems laudatory, though there is an interesting debate about how to judge the risks and benefits of specific medications, and Kinderman prefers to leave this in the hands of others. Those readers who get beyond the first half will find themselves on more interesting territory. Books that criticise psychiatry are common enough, but a considered and viable set of suggestions for improvement of the mental health system is much harder to come by. A number of the issues Kinderman raises are very important, and the book is good on linking its own position to the debates that are taking place within the profession of psychiatry itself. What is more, many of the suggestions made in the last six chapters are not dependent on his having won over the reader in the first three. Alzheimer’s is a brain disease, but that shouldn't rule out the provision of psychosocially oriented residential care for sufferers. Down’s Syndrome is a genetic disorder, but it would be extremely myopic not to provide care and support of an imaginative and holistic nature for this population. Thus, regardless of his audience’s prior commitments on the nature of mental health problems, Kinderman is going to find much more agreement on the broad thrust of chapters 4 to 9. Many of these questions go well beyond a simple question of which profession is dominant and which intervention is the “correct” one. He is quite right to advocate a holistic approach to wellbeing, and his proposal for comfortable, decent residential care (“a place of safety”) over psychiatric hospital wards should be a public health priority. These latter can be traumatising and chaotic (not to mention expensive) places, and the “medical” context can place unnecessary limits on the nature of the care that is provided. Under Kinderman’s model, a new generation of local authority funded homes would provide safe, calm places for “respite” rather than “cure”. A suggestion that mental health nurses be renamed “psychosocial therapists” (on the grounds that “nurse” is overly medical) seems, to my mind, unnecessary given that the verb to nurse has thoroughly humanistic connotations. Hanging over all this is the audacious idea referred to above. In "Our Necessary Shadow", Tom Burns doubted psychiatry would even exist without Schizophrenia and Bipolar Disorder. Kinderman's most radical conclusion pushes that logic to it's ultimate conclusion. In a chapter on promoting health, he suggests that psychiatrists add little value to mental health beyond a general medical consulting role. In his breathless (and well thought out) penultimate chapter he even insinuates that we could save considerable expenditure if our mental health system did without them altogether. While it has often occurred to me that other professionals could perform many of the legal and leadership roles currently undertaken by psychiatrists, to argue they are entirely redundant relies on the acceptance of a conclusion that Kinderman has already taken for granted. Namely, that the field currently denoted by those two headline diagnoses is one devoid of anything resembling an illness or disorder. I am considerably more agnostic than Kinderman on this score, so while I have to credit him for such an invigorating interrogation of the “value added” of psychiatrists, I don’t think the argument has been won. Further, even if you do accept such a premise, the expertise required to distinguish "organic" psychiatric presentations from "functional" ones (yes this is something like a dualism, but it's really just a loose way of talking: think of the distinction between a drug induced psychosis and a psychosis whose causal factors are more diffuse) is not something psychologists are trained to develop. This is a rip-roaring book; readable and broadly constructive. Like the broader debate of which it is a part, it succeeds where it is most surprising and lets down where it is most predictable.